A Year Through The Lens: Day 277 - Floating sunsets. 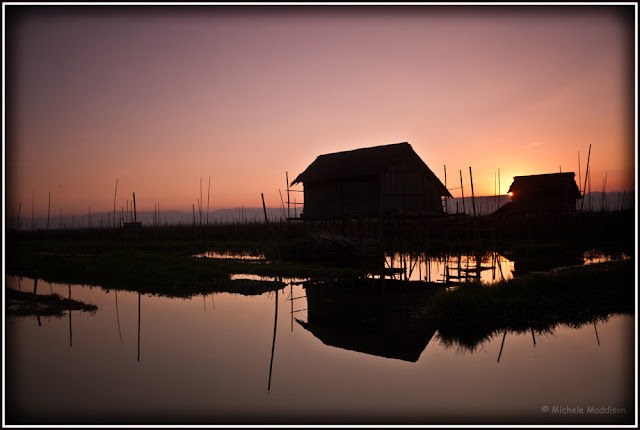 Inle Lake is 34km long, and everything happens on the water. Living, fishing, gardening; tomatoes, flowers, vegetables on floating garden beds amazing. Tall teak houses are built on poles, appear out of the water. Making up villages amongst the channels of floating gardens on the fringe of the lake. So what better way to see the sunset? Slap on the mozzie repellent, jump on a floating island. Keeping your distance from next person to distribute weight of westerners, so you don't sink (not as easy as it sounds). Watch a little bit of magic happen over the waters of Inle Lake. A great way to finish off another amazing day.